Barnes & Noble might have announced plans to spin off Nook Media into its own publicly traded company early next year, and after looking at B&N's ongoing investment in its digital sub I think the plan is going ahead, full steam. The largest bookstore chain in the US has just announced that they are now going up against CreateSpace, Lightning Source, Blurb, and other competitors in the POD market. And it looks like B&N may have crawled into bed with Author Solutions to do it. 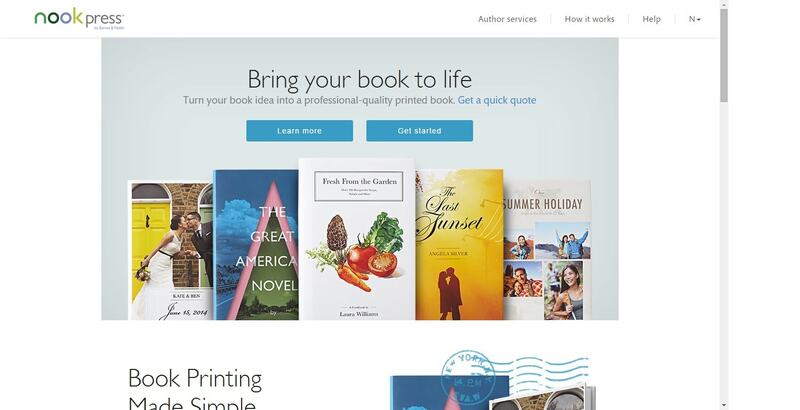 Designed to be simple and customizable, the NOOK Press print service provides customers with a complete do-it-yourself experience for creating a hardcover or paperback book. The new service offers black and white or color printing, high-quality paper choices, multiple trim sizes and cover treatments. With print costs starting at $4 per copy for a 5"x8" paperback, Nook Press POD can handle both color and B&W; hardback and paperback; and it can support the common book sizes from 5" x 8" to 8.5" x 10". That's going to drastically limit the value of the Nook Press POD services, given that Lightning Source and Createspace both offer distribution to bookstores. In related news, B&N is also launching a new author services section today to help enable authors to get their ebook and print book on the market. Authors can now choose from a variety of packages and a la carte services to receive professional assistance making their book, including editing ($399 and up), cover design ($499), and package deals starting at $999, B&N has all of the bases covered. It's not clear who is actually providing the services on behalf of B&N, but one thing I can tell you is that they are rather expensive. I have also noticed that the package deals bear a worrisome resemblance to the packages offered by Author Solutions under its various guises. I am still waiting for B&N to get back to me on that point, so you should take that observation with a grain of salt. But even if I am wrong in making the connection, I would still suggest that authors avoid this part of Nook Press because the prices are simply too high. The package deals cost more than similar packages at AuthorHouse and offer fewer amenities. That alone is a good reason to avoid them. But I don't know I can make the same claim about the POD section. What do you think of the POD prices at Nook Press? Here's a thought I had right after publishing this post. At first I was puzzled that B&N would invest in a sub that was being spun off next quarter, but now that I have looked over the services I think i understand what is going on here. In adding more services, B&N is trying to make Nook Media more attractive to a potential buyer. Rather than simply be a (failed) ebook platform, Nook Media can now be pitched as a digital publishing services company. It's my guess that both the POD and author services have been outsourced. The actual investment for B&N is far less than what it would cost to develop those services from scratch. The services might not be very attractive to authors, but that's not why the services were launched. This is a Wall Street play, not a move to invest in a market. B&N's goal is to make Nook Media more attractive to potential investors, and it will probably work. I ran some numbers on the POD prices and it worked out to $9 a copy plus taxes – which is almost double the cost of Createspace. So that’s a rip off too. I wonder who that was outsourced to? BTW, about 3 minutes after you left this comment, I added an addendum to my post. I think I nailed why B&N added these services. Yeah, that makes a lot of sense. Attach crappy services, then flog Nook Media before the complaints start rolling in. Can you clarify those numbers, David. We’ve just checked a CS-published title with 242 page, 6×9, cream paper, matte finish. Minimum price allowed to actually sell that book on Amazon: $ 9.38. The same title can be published hard-cover printed case for $10.50 and just $11 for hard cover with dust jacket, with neither an option from Amazon. The disparity increases with the size of the book. I ran the numbers of some of my own print editions and compared the costs. Not quite double, but getting there with bigger books. I’m sure something over 100k would hit double, but I don’t have anything that long. But this is all academic really. I’m not sure what the general demand will be for a POD service with zero distro. …but *will* list CreateSpace and LightningSource books. Yup. That’s going to fly. The hardcover option (which CreateSpace doesn’t offer) is interesting for authors who don’t want to muck around with Lightning Source. Probably pretty expensive though. Not sure why Nook got into this though: there’s a lot of competition and CreateSpace does POD pretty well. I think B&N is working their way twards selling Nook Media, and they added these services to make it more attractive to investors. The thing with Ingram LightningSource is, your books *will* get distributed through Ingram and any bookstore can order them and stock them just like a Big-Five title. I have my LightningSource-printed, Ingram-distributed books selling on the shelves of Barnes & Noble stores, indy book stores, local stores, etc. And when those stores sell their last one, they automatically re-order more. (Returns is a big problem, granted, at 25% or so… but a B&N store manager assured me that was actually a “good” return rate — she told me that for James Patterson, returns run around 50%). But this new B&N service is not any kind of competition at all for LightningSource, let alone CreateSpace. I see nothing here other than a cynical attempt to extract money from uninformed newbie authors, and to put some lipstick on the pig before taking it to market. If B&N won’t distribute or shelve their own books from this new print service, or even list them in the barnesandnoble.com online store — something they’ll do for CreateSpace titles — then I just don’t see how a 2003-style B&N-branded vanity press offering brings anything to the table for writers. This is twisting the truth a lot. While, yes, both services will offer to ship books to stores, neither service offers vendor returnable merchandise agreements, which means almost no bookstore will actually stock them. Amazon will stock it. And others can order it. Ingram and Baker&Taylor will list them and handle returns as long as the pricing allows typical discounts and the book has a publisher-specific ISBN. Lightning Source and CreateSpace POD’s are both coded nonreturnables for both Ingram and B&T. Trust me, kiddo, you have no idea what you’re talking about. You’re flat wrong on LightningSource. 2. Ship it to him. Both are far poorer options than that for traditional books, where the returned copy goes back on the warehouse shelves. I suspect few publishers sign up for it. I know I never have. Which is where getting your own, non-CS ISBN comes into play, as per DWS’s suggestion. That way the book lists out like a small press title. Prices seem similar to Lulu on a couple that I checked with the B&N “quick quote” page. I wonder if that is who is doing the POD? True, Lulu did get into bed with AS. Yuck! I neither need nor want distribution channels, and only use Lulu for printing. (Love the zero set-up fees.) Just ignore the relentless marketing hype. I won’t deal with Amazon/Createspace; and last time I checked, Lightning Source was priced out of our league. It’d be nice to see an independent POD service that isn’t any of the above, yet is as cheap as any of them for straight one-off copies and no distro. I’m all ears and whiskers if you hear of any. B&N entering the POD market makes no sense. Amazon’s CreateSpace owns the low-cost slice of the market. Ingram’s Lightning Source has the widest distribution by far, both nationally and internationally. What can B&N’s POD bring to the table? Almost nothing beyond perhaps a bit better access to its stores. They’re be better off improving their ties with Lightning Source or gritting their teeth and distributing for CreateSpace. As a publisher, I will say that creating two print version to differing cover specs for CreateSpace and Lightning Source is already a nuisance, particularly in addition to all the digital editions the market requires. I’m not going to take on a third. It really doesn’t make any sense, no. That’s why I think this move has a different purpose. I don’t think it’s about the POD – I see it as an add-on of the Author Services. You buy a package for $999 or $1999 which doesn’t include proper editing, only an editorial assessment. That assessment then recommends line editing (almost $3k for an 80,000 word book) or dev editing (well over $6k for the same length). That’s where the money is, and that, presumably is what will make this attractive to investors (and shady for writers). The POD is purely there (IMO) to help sell the packages, which are designed to upsell the editing services etc. It also explains where the “selfpub is expensive” zombie meme comes from. Convince the unwary that “doing it right” costs an upfront arm and a leg so they’ll cough up both arms and legs for peanuts. But Amazon doesn’t even do, let alone own, the POD hardcover market. That alone makes this new venture from Nook very appealing to indie authors. And the hardcover prices are very competitive compared to the likes of Bookbaby and Lulu. The feedback we’ve had so far is that the paperback option with no distribution is pretty irrelevant, but that the hardcover options are of great interest. For authors who have their manuscript ready to go then as an addition to the indie toolkit, rather than replacement for CS, this looks like a good deal. In contrast, publishing a paper book on Createspace gets your book into BN.com. So Barnes and Noble will carry POD books from a competitor, but not from their own POD service. Are they serious? On a whim, I priced a 326-page book, premium color cover, B&W interior, cream paper, and was told only white paper available at this time. Plus the price per copy I got was $43!!! A bit of history and some insider observations from my decades of experience with digital publishing as an author and vice president of Author Services for Infinity Publishing from 1999 until my premature retirement in 2011. In the mid-1990s, at the start of the digital publishing branch of the book publish industry, there was a POD publisher with the imprint “The Great Unpublished” to attract writers with unpublished manuscripts. I never talked with a writer who perceived any “greatness” in the “unpublished” tag—although there is a “greatness” in the number of unpublished writers. With a change of owners they became “Book Surge” perhaps with hopes of becoming a surging source of POD books. Book Surge and Infinity were unique because they both produced books in-house enabling consumer friendly prices competitive with trade paperbacks published by the mainstream houses and of similar quality. POD publishing services, such as Author Solutions (previously known as 1st Book and Author House), iUniverse, Xlibris, etc., outsourced book production to Lighting Source or other commercial digital printers. The POD publishing services marked up the outsource services which resulted in high retail prices. Selling services accounted for 60 to 90% of their annual income—even if no books sold the publishing service made a handsome profit selling services. iUniverse and B&N formed some kind of a relationship in the early 2000s. At the same time one of the big traditional publishers was loosely associated with Xlibris. Book Surge was purchased by Amazon in the late 2000s and the name was changed to CreateSpace. Feedback from author I referred to CreateSpace has all been very positive. Lighting Press started out doing digital printing for the “trade” but became Lighting Source when they got more involved in distribution and providing publishing services for authors. Lighting Source shares a parking lot with Ingram so arranging book distribution with the industry’s largest book wholesaler was a no-brainer. Ingram sold books to B&N—but B&N refused to have anything to do with handling POD books because of a secretly conspired agreement with the Big Six publishers and major newspaper reviewers to keep POD books out of the chain stores. Efforts to have Infinity titles carried in B&N stores were fruitless. Their Small Press director explained we had no return policy. Within a few months we offered retailers one of the most generous and liberal return policies in the industry at no cost to our authors—made possible because of our in-house book production. Another B&N objection was POD books were plagued with typos. We offered to provide a monthly listing of our 100 top sellers for B&N to consider—books with a positive sales history continue to sell in greater numbers. No way, B&N said they would not handle any book that wasn’t reviewed by the major media reviewers. Of course the reviewers refused to review any POD book that didn’t have national distribution via the chains. No reviews equals no distribution; and no distribution means no reviews, “Catch-22” applied. Thanks to establishing a workable return policy for retailers, many of Infinity’s more popular books sold in respectable numbers through Amazon, Baker & Taylor, independent bookstores, and bn.com—yes, B&N’s online bookstore listed all of our titles on their website and ordered weekly. New owners took control of Infinity Publishing in 2010. They outsourced all book production which delays getting books to retailers and authors, started pushing pricy bundled services, and most likely dropped the return policy. Thusly the odds are NOOK POD books will be sold via bn.com but not through their remaining chain stores. The more things change, the more they stay the same. Most likely NOOK POD has adapted the dubious Author Solutions publishing model or they entered into some kind of an imprint agreement for Author Solutions to provide the profitable backend services—so to speak. Bundled services are usually overpriced and of questionable value to the author. Packaged publishing services rarely produce enough income for the author to recoup the cost of the services; however as previously mentioned, the POD publishing service realized a profit without a single book being sold. When you consider all the reported problems authors have had with Author Solutions, and their variety of imprints, it is unlikely NOOK’s venture into POD would enhance its attractiveness to potential buyers. NOOK would be trying to compete with CreateSpace which has the advantage and the ability to add additional innovative benefits for authors.